"What is Christ doing for us in the heavenly sanctuary, and why is it so important for us to understand it in the last days especially?" Good morning, friends, and welcome to Sabbath School Study Hour here at the Granite Bay church. I'd like to welcome those who are joining us on Facebook and online across the country and around the world. We'd also like welcome our online members. Thank you for being a part of our study time together this morning. Now over the past few weeks, we've been studying through a new lesson quarterly entitled preparing for the end times, just a great series of lessons. And today, we're on lesson number 5, which is entitled "Christ in the heavenly sanctuary," so that's going to be our study for this morning. Before we get to our lesson, however, I'd like to let those watching online on our Facebook, I'd like to let you know about our free offer for today. Now it's going to be a little different, so you'll want to pay attention to this. We have a digital download of a sermon dealing with this subject called the cleansing of the temples. Now the way that you get this free download is you need to text the following code sh014, that's Sabbath School Study Hour 014, sh014, and you want to text that to the following number, 40544. So the phone number is 40544. You text the number sh, or the latest sh014, and you'll be able to download a digital copy of our free offer for this morning. Well, before we get to our study time this morning, as we normally like to do, we like to begin our program by lifting our voices in song. When he cometh, when he cometh to make up his jewels all his jewels, precious jewels his loved and his own Like the stars of the morning his bright crown adorning they shall shine in their beauty bright gems for his crown He will gather, he will gather the gems for his kingdom all the pure ones, all the bright ones his loved and his own Like the stars of the morning his bright crown adorning they shall shine in their beauty bright gems for his crown Little children, little children who love their redeemer are the jewels, precious jewels his loved and his own Like the stars of the morning his bright crown adorning they shall shine in their beauty bright gems for his crown Thank you so much for singing with us. And at this time, Pastor Ross will have our opening prayer. Dear Father in Heaven, again, we thank you for the opportunity to gather together and open up Your Word and study this very important subject, talking about Jesus and his high priestly ministry in the heavenly sanctuary, please be with us. Guard our thoughts, our hearts, and help us to see the work Jesus is doing for us and the work he wants to do in us. Thank you, Lord, for your promise to be with us. In Jesus Name, amen. Our lesson today is going to be brought to us by Pastor Doug. Morning, everybody. Good morning. And we're glad to see every one of you here at the Granite Bay church. I want to welcome those who are watching our Sabbath School Study Hour. And as Pastor Ross mentioned, we are continuing on through our lesson dealing with preparation for the end time. That's pretty appropriate, don't you think? I heard in the news yesterday that missiles had been fired in the middle east. But I don't let that shake me. The Bible says there will be wars and rumors of wars until the end. The important thing is not so much what's happening in the headlines but what's happening your heart. That's how we get prepared for what's coming. So our lesson today is dealing with a very important and often neglected and misunderstood subject about the sanctuary, and in particular, talking about Christ in the heavenly sanctuary. It's lesson number 5, and we have memory verse. And the memory verse is from Philippians 2:9, 10. I'll be reading it from the new king James version, Philippians 2: 9, 10. Are you ready? I'd like you to say it with me. Here we go. "Therefore God has highly exalted him and given him a name which is above every name, that at the name of Jesus every knee should bow, of those in heaven, and those on earth, and those under the earth," heaven above, on the earth, under the earth, who are those under the earth? It's talking about the... It's sort of a poetic language, talking about... Even the devil and his forces will someday bow. Now I don't know how I can possibly overstate the importance of understanding the subject of the sanctuary because it is woven in the warp and woof of all the Bible. It appears there in the beginning, in Genesis, if not there, Exodus all the way to Revelation. Just to give you a little score here. The word "temple" is found 378 times in the Bible. The word "sanctuary" 165 times, the word "tabernacle" 333 times, and sometimes various sundry places it'll say "my house" adding up to about 928 times in the Bible, the sanctuary is referenced, that's more than the name of Jesus. And so this is a very important subject. Now there are important characters in the Bible. You can talk about Moses, and he's a great character in the Bible. You can talk about Abraham, talk about Jesus, talk about David, but there's a great building in the Bible, when we think about personalities, we can learn so much from the people, but you can actually learn something from a place. It's a building that teaches us. Now the reason this is so important is 'cause Christ compares himself with the building, he integrates himself with the building. I'm going to give you a number of verses to look at. And a matter of fact, I'll be surprised if we get through all our verses, I should probably pause here and remind our friends, I want to welcome those who are watching online and satellite, but if you have questions, if you're watching either online, satellite, you can text us or Facebook us questions. Last third of the lesson we usually take two or three questions that come in and that are on the lesson. I'm going to cover a lot of Scriptures. Psalm 77:13, "your way, o God, is in the sanctuary.
" The way of God, the will of God, the way he saves us, it's in the sanctuary. And maybe before I go any farther, I should just give you a little visual picture. When the children of Israel came out of Egypt and they went through the red sea, God did not say, "okay, we're going to make a beeline to the promised land," instead they headed south. And he took them to Mount Sinai and gave them the Ten Commandments. But while he was on the mountain, he also received the ceremonial law and basically, they had a whole new economy that was begun. They had a new calendar that began with the passover. And he said, "you're going to build a place, a temple for me." The later temples that were built... The first one was portables, it was very ingenious. The other ones built by Solomon, subsequently by the time of Ezra and Nehemiah, and it was refurbished by herod the great, that was the third temple. So they were like these three earthly tabernacles. They all followed basically the same principle design. You entered, there's a main door, and there was an altar in the courtyard, place of sacrifice, one door in. Then beyond that, there was a lever, big basins where hands and feet of the priests could be washed and other things could be washed. Then from there, you entered into what they called the holy place, which was a sacred room that only the priests could enter into, The Sons of aaron. The levites would do ministry in the courtyard, but only The Sons of aaron served as priests. And in there you had three articles of furniture. You had a table with bread on it, you had a candlestick, seven lamp stands. We talk about menorah today, but they had that back then. And you have an altar of incense. It was a little altar where they would put incense on. Then there was the final room which was what you would call the holy of holies or the inner sanctum and it's where there was one article of furniture, it was the national treasure, and inside the national treasure was the Word of God. It was a golden box, sometimes called an ark, the word ark just means container. Noah built an ark. Jochebed, Moses's mother, built an ark. She put her baby in it, and it's a container. And this container, this golden container, everybody would love to find the golden container. But the important thing was the rocks inside that had the Word of God written on them, the law of God, the Word of God, the rock upon which the government was built. It was the constitution of Israel. It was holy. It was something that was sacred because God's finger etched it, God's mouth spoke those words, and so it represented the presence of God. Above the ark, they called it the mercy seat, two angels. And between the two angels looking down towards the Word of God, there sometimes his glory would appear and this shekinah glory would shine out of there, and it represented the presence of God. Moses would often walk into the sanctuary to commune with God and he would speak with this shekinah glory that was there above the mercy seat in the holy of holies. Moses, a type of high priest, he could go in, is also a type of Christ, okay. There's a picture of the sanctuary. So first thing, if you want to be forgiven, the sanctuary represents the presence of God. They were told to pray towards that place if they were carried away. So Daniel prayed towards that place, it represented the presence of God, the earthly sanctuary was a model, a miniature model, of a very real dwelling place of God in heaven. Now it's an imperfect model, and each time they built the sanctuary, they tried to make it a little better. The temple of Solomon was the most beautiful of all, it was a lot more elaborate than the wilderness portable sanctuary they have. But they all represented the dwelling place of God. On earth, there were golden angels above the ark, in heaven, God does not have golden angels by his throne, he's got real ones. On earth, they had wallpaper with angels engraved in it, in heaven, there is not a wallpaper golden angels, they have a living wall of angels, ten thousand times ten thousand and thousands of the thousands ministering spirits that God has created, the angels. And on the veil between the holy place and the most holy place, there were angels woven into the fabric. God does not have a curtain hanging in heaven somewhere, he's probably got a wall of angels. And so the things about the heavenly sanctuary are going to be a little different. But notice really quick, you walk in, you're separated from God on the outside, the whole idea of the sanctuary is to approach God. Do you notice it's a straight line? You walk through the door, you got the altar of fire, you got the altar of water, you walk in, and then there's a door beyond that, you get the holy of holies, you're trying to get to God. There's three rooms, there's three phases. You are justified in the courtyard, you're sanctified in the holy place, and if you get to the presence of God, you are glorified, that's glorification. The children of Israel went through three stages in salvation. They were justified by the lamb in Egypt, they were sanctified in the wilderness, they finally received the promise when they're glorified in the promised land. How many doors were there into the sanctuary? One door. How many doors does Jesus say there are? One door. Who does Jesus say is the door? He says, "I'm the door. If anyone tries to go over the wall, he's a thief and a robber," there's one door, there's one way. People, "oh, there's many rivers that lead to the ocean." It doesn't matter what you believe. There is one way, there is no other name given among men whereby we must be saved. He is the door. Then you walk to the altar. And that's a symbol of the cross where Christ suffered for us, and he was offered for us, and they put a lamb on the altar there, the lambs were slain by the side of the altar. Who is the lamb? Jesus. And then the lamb's blood was offered by the priest. Who is the priest? Jesus. Jesus. And then you went to the water. Who is the living water? Jesus. Jesus. And then you went into the holy place and you got a stack of bread. Who is the bread of life? Jesus. Jesus. And then on the other side you got a candle stick with light. Who is the light of the world? Jesus. Jesus. And then you have the altar of incense, and it tells us in Revelation that the prayers of the saints ascended, in whose name do we pray? Jesus Jesus. Then you go into the holy of holies and it's this ark that contains the Word of God. When did God come to earth where His Word was contained in a person? Jesus. It's Jesus. Who is the rock? It's Jesus. The whole sanctuary is telling us something about Jesus. Now I'm just giving you the fifth grade level here. I'm just doing a quick flyover, it is much, much deeper than that, but I don't have time to go into it. So you can see how this building is telling us not only about how we're saved, but it's all talking, it's telling us something about Christ. I want to just give you a few Scriptures that illustrate how much the Bible has to say about the sanctuary, and it's just a few. In a moment, someone's going to read for me psalm 63, okay. Isaiah 6, the vision, conversion of Isaiah. How does it happen? Isaiah 6:1, "in the year that king uzziah died, I saw the Lord sitting on a throne, high and lifted up, and the train of his robe filled the temple." What's the Lord sitting on? His throne. Where is it? In the temple. "Above it stood seraphim, each one had six wings: with two he covered his face, with two he covered his feet, and with two he flew. And one cried to another.
" So how many seraphim are there? Two. It's like the cherubs by the throne of God. "Holy, holy, holy is the Lord of hosts." It's one for The Father son and spirit. "The whole earth is full of his glory! And the posts of the door," these pillars, there are two great pillars when you entered Solomon's sanctuary, they even named them. I just know one that's called boaz, I forgot what the name of the other one was. Jachin. Jachin. And you remember what they mean, boaz means strength, what does jachin mean? I forgot. I'm getting old, I forget some of these things. Anyway, there are two big pillars, bronze pillars. And so here Isaiah's vision is the heavenly sanctuary. Go to Daniel 8, an important verse for us. Read in verse 11. "He even exalted himself," speaking of the beast power. "He exalted himself as high as the prince of the host, and by him the daily sacrifices were taken away, the place of his sanctuary cast down.
" So what does the devil want to do? Cast down the sanctuary. You go to verse 14, "he said, 'two thousand three hundred days, the sanctuary will be cleansed.'" There will be a restoration. So there's a battle going on about this sanctuary. Go ahead, please read for us psalm 63. "So I have looked for you in the sanctuary to see your power and your glory.
" If you want to see the power and the glory of God, David said, "it can be found in the sanctuary." Look at Ezekiel 10, and I should probably tell you if you want to read about the sanctuary in Ezekiel, you may as well read the whole book because you find the word 47 times. Ezekiel 10, you can read all of them, read verse 3 here. "Now the cherubim were standing on the south side of the temple when the man went in," this angel "and the cloud filled the inner court." That happens in the book of Chronicles. "Then the glory of the Lord went up from the cherub and paused over the threshold of the temple; and the house was filled with the cloud, and the court was full of the brightness of the glory of God." And so you just see that here these prophets, they're often talking about these prophecies happening in the sanctuary. Look at Haggai 1:7, "thus says the Lord of hosts, 'consider your ways! Go up to the mountains, bring wood, and build the temple, that I might take pleasure in it'" Haggai is the one who said, if you want God to bless your house, you need to build his house. Now that's always a good thing for a pastor to say when you're in a church building program. And it is true, but it's bigger than that. If you want him to build your house, then we need to build up his church, his work. It's not just talking about the building, but it can be used that way. Revelation 1:12, "then I turned to see the voice of him who spoke with me. And having turned, I saw seven candlesticks." Where does that appear? First chapter of Revelation, the vision is taking place where? Sanctuary. And you go a little later in Revelation, it says, I saw the temple of God open in heaven, I saw the ark. A little later in Revelation, it says, I saw the altar of incense, and under this altar, the saints are praying and crying, and so you see the furniture of the sanctuary all through Revelation. It's very hard to understand some of these prophecies if you don't understand the importance of the sanctuary. Quite a few of the Bible prophets, Daniel, Ezekiel, Zechariah, Isaiah, their visions are in some way in the context of the heavenly temple. Now let me give you a quote from the book the Great Controversy. This is page 488. "The subject of the sanctuary and the investigative judgment should be clearly understood by the people of God. All need a knowledge for themselves of the position and work of their great high priest." That's what we're studying today. "Otherwise it will be impossible for them to exercise the faith which is essential at this time or to occupy the position that God designs them to fill.
" That's pretty serious. Now why is that important? There is a false teaching that goes around, it's called once saved, always saved. And it places great emphasis, and it's appropriate to place great emphasis on the work of Jesus as our lamb. But if you stop there with the work of Jesus as our lamb, then really it's all justification and you don't understand sanctification and glorification. Is Jesus' work for us over? No. Matter of fact, he rested in the tomb on the Sabbath, he rose on the first day to continue his work at the right hand of The Father, where he ever lives to make intercession for us. When you pray, we plead the blood that was offered 2,000 years ago, but we're talking to a living God, the Bible says, through faith we boldly come before his throne of grace, where Jesus is entered for us, he is our high priest. And so understanding that he is still a living God, he's very active and he's involved, and there's a work that he is doing on our behalf in heaven is very important for the people of God. If there's going to be people in time that are going to be mature in understanding the role of God, this would be that generation, right? If not now, then when? And so this is important. So what is Christ doing for us in the sanctuary? That's what the lesson is talking about. And why is it important for us to understand in the last days? Okay, we're going to... That was a long introduction, sorry. We're going to the first section, the supreme sacrifice, talking about the lamb that was offered. Well, actually, the importance of the lamb, we get to the lamb in just a moment. Now look for instance in Romans 8:3. "For what the law could not do in that it was weak through the flesh, God did by sending his own son in the likeness of sinful flesh, on account of sin. He condemned sin in the flesh," that's a very important verse, talking about the incarnation. When Jesus came, did he come down as a divine being? Did he walk around glowing or did he take on the form of sinful flesh? Doesn't mean he sinned, but he took the body... Was adam taller than us? And eve? Yes. And they lived longer. Yes. More powerful. Has something happened to the human race in the last 6,000 years? Sin has degenerated the race. We've got genetic problems and our lives have been shortened. Did Jesus take the form of a 20-foot tall adam when he came or did he take the form that had been degenerated by sin? That's right. He took sinful flesh. He didn't have sin, it just means he took a body. How does the book of Matthew begin? The generation of Jesus Christ, right? It goes through his family tree. Why does it go through his family tree? It tells us about all the different dna that ended up coming into this body. Yes, it is true, he was conceived by the Holy Spirit, but there was definitely something human in him. He probably looked very much like the people of his time because he had some of that dna. So Jesus came as a human, he condemned sin in the flesh because while he was in his flesh, he, through the power of The Father and the Spirit, lived a holy life as an example that through the same power we through trusting in him can be new creatures. Amen. Did that make sense? All right, read in 1 Timothy 1:17, "now to the King eternal, immortal, invisible, to God alone who is wise." And you read in 1 Timothy 6:16, speaking of God, "who alone has immortality." So one of the things we learned about Jesus was he created. Remember, the Bible says, "for God so loved the world he gave his only begotten," begotten, that means there was a time when he was brought forth. Was Jesus created? Did God make a creature to die for our sins? If he's created, then he's not the creator. Jesus is immortal. He's eternal, from everlasting to everlasting, he is the alpha and omega, he's without beginning and without end. Christ is everlasting. So I want you to. .. This first part of the lesson is trying to help us grasp the magnitude of what was given in the sacrifice. Almighty God gave himself in his son. And you can read again 1 Corinthians 15:53. When do we get immortality? Are we immortal now? Every day I look in the mirror, it's looking worse. And I'm reminded that I'm not immortal. Something is happening that isn't good. Hopefully, something good is happening on the inside, but the outside, not so good. You know, when I got my first gray hair, I plucked it out. Unfortunately, all of my gray hair appeared on top, so see what happened? You can't fight it. Philippians 2:5, "let this mind be in you," and this explains how he condescended and humbled himself. Someone's going to read for me John 2:19 later. "Let this mind be in you which was also in Christ Jesus who being in the form of God," so prior to the incarnation, he is in the form of God, "did not consider it robbery to be equal with God," for him to claim equality with God is not stealing, it was appropriate, "but he made himself of no reputation." He not only... He didn't say, well, yeah, I'm closely related to God, he took no reputation, "taking the form of a bondservant," born in a stable, "and coming in the likeness of men and being found in appearance as a man, he humbled himself," laid aside his divinity," and became obedient to the point of death," when he said, "father not my will, thy will be done," he surrendered to the death, even the death of the cross. And for this cause, God's going to exalt him above every other name. All right, and then go ahead... Well, no, here I'll read Luke 9:22, Jesus warned them about his suffering several times. "He said, 'The Son of man must suffer many things and be rejected by the elders and the chief priests and the scribes, and be killed, and be raised the third day.'" So he came as a sacrifice. He knew that was part of the plan. Go ahead and read for us John 2. "Jesus answered and said to them, 'destroy this temple, and in three days I will raise it up.' But he was speaking of the temple of his body." All right, so here we've got the connecting link in this, between Jesus and the temple. He said, you know, Bible says, don't you know, your body is the temple of the Holy Spirit? But Christ said, my temple, my body is a temple too. The church is the body of Christ. The Bible says that you and I are living stones. Ephesians says we are build up into a holy house that is inhabited by God. When Christ died, and this is just so important, when Jesus died in 31 ad, and there was a great earthquake, what happened in the temple on earth? The earthquake, the veil was ripped from top to bottom by hand? An angel. And when Christ died during the passover, he fulfilled the purpose of the sacrificial system. He was the passover lamb. We all together? Not only was the veil in the temple rent, representing that we now have a new temple. Remember, Jesus said, destroy this temple made with hands, three days I'll make one without hands. In fact, what I just quoted to you is a little different from John. What I quoted to you is what they said at his trial. They couldn't get any two witnesses to agree. The only two witnesses they could get to agree are the ones you said, we heard him say, destroy this temple made with hands, and I will raise up another one made without hands. Now we know he's speaking of his body, his church. Church is the body of Christ. So we are built up to be a dwelling place of God, Christ is the cornerstone, look at all the verses on the cornerstone. Why cornerstone? Cornerstone of the temple. And so much of the Bible is saying now, we are a living house, Christ doesn't inhabit a building where you go in and you've got just a few priests to come in, we become a nation of priests, as a living temple, as the body of Christ, we are to make atonement, every believer is to bring others to Christ. When you bring them to church, you bring people to Jesus, you help them find out about the plan of salvation. It's all depicted in this old testament economy. Am I making sense or am I rambling? Karen tells me sometimes, "you're rambling." And so I just... I wanted to know. A little bit, huh? Okay. Let me tell you why I think this is so important, and I'm spending a lot of time on it. Now this is a quote you don't hear very often. This is review and herald, may 25, 1905, from the Spirit of prophecy. "In the future, deception of every kind is to arise, and we want solid ground for our feet. We want solid pillars for the building. Not one pin is to be removed from that which the Lord established. The enemy will bring in false theories such as the doctrine that there is no sanctuary." Have we encountered that? This was foretold in 1905. It perfectly came to pass. "This is one of the points on which there will be a departing from the faith. Where shall we find safety unless it be in the truths that the Lord has gives us for the last 50 years?" When she wrote that, for 50 years, the Lord had given them truths about the importance of the sanctuary message. And I think that is still true today. Can you say amen? Amen. All right, now we're going into the next section, the lamb of God. We talked about the importance of the sacrifice, the value. The Bible tells us that when you brought a lamb, could you bring any kind of lamb? It had to be perfect. So what greater gift could be given than God? God gave himself. And when you think, what could be more valuable... You know, kids like to ask the question, "can God make a rock too big for him to lift?" If he can do anything, he should be able to make a rock too big for him to lift. But if he can do anything, he can lift it. It's one of those circular questions supposed to just waste your time. But how can you find anything more valuable than the creator? Because if the creator, one had to make something more valuable, well, the one who made it is always going to be worth more than what he made 'cause he can make another one. You know what I mean? It's like eating the goose that made the golden egg. So when you sacrifice Jesus, it's the creator. What more can God give than when he gave his son, and he is referred to as the lamb. That's what they brought for their forgiveness. Someone's going to read in just a moment. Looks like John is going to be reading John. John 1:35, I'm going to read 1 John 1:29, "and the next day," this is at the Jordan river, "John saw Jesus coming towards him and he said," John the baptist said, "behold! The lamb of God who takes away the sin of the world!" Now why did he say that? I'll get to that in a minute. Go ahead, read your verses are very similar. "Again, the next day, John stood with two of his disciples. And looking at Jesus as he walked, he said, 'behold the lamb of God!'" So on multiple occasions he says, "behold the lamb, behold the lamb," that's the whole sermon in itself. Now we are told to behold Christ. Christ said, "if I am lifted up, I will draw all men to me." When they lifted up the serpent and the people looked in faith, they were healed from the venom that was killing them, they looked and they lived. And so there's some power in beholding Christ. We are transformed, the Bible says, "by beholding, we become like what we look at." And so when John said, "behold, the lamb of God," there's really a very important lesson in that. How was Isaiah converted? In the year the King Isaiah died, I saw the Lord. He sees the Lord in the year that he died. You know The Song if we sing about looking at the cross, beholding the cross, beneath the cross, there's something about looking at the lamb of God. Do you remember when Abraham went up the mountain with Isaac, and God had told him to offer his son. Abraham had not revealed it to Isaac yet. And as they're going up the mountain, he knows the time is coming, he's got to tell him what's going on 'cause he's a smart young man and he realizes we're going to sacrifice. Okay, father, we've done that before, they've gone to the mountains of moriah, and Abraham said, "Isaac, you carry the wood, and I've got what it takes to make the fire, we've got a knife, let's head on up to the place of sacrifice." And finally, he didn't want to question that his dad was getting old and forgetful. But he says, "father, help me, we've got the wood, we've got the fire, where's the lamb?" And Abraham said in those immortal words, "my son, God will provide himself a lamb." Now that's understood that God provided a lamb that day for Abraham, there was a ram caught by its horns, God provided a ram. But it's a bigger picture, God would provide himself a lamb, and that's what happened. God The Son provided himself a lamb for our sacrifice. So when. .. And through the ages, they all keep wondering, "when will God come incarnate? When will the Messiah come?" When John the baptist, there at the Jordan said, "behold the lamb of God," that was a breathtaking statement because they were coming to John, saying, "are you the Messiah? Are you Elijah who is to come? Are you that prophet that Moses talked about?" And he said, "no, no, I'm not worthy to bear the shoes of the one that's coming." Finally, when he saw Jesus, it's like, you know, drumroll. I mean, I can't emphasize how important it was, it was a moment. They saw the heavens open, they saw him illuminate, especially the baptism of Jesus. So he was identified as the lamb of God, even a voice from heaven, said, "this is my beloved son," so it was a big announcement. This is the lamb of God. Okay, I've got a couple questions I see have come in. I just want everyone to know, I don't see these questions in advance. So, "where is the ark of the covenant today?" Well, it's a good relevant question. People always want to know that. That question has become popular for a couple of reasons. One of them is they made a movie about it. But as near as we can tell, there's no statement that tells where it is but you can deduce with some safety. We know that when Nebuchadnezzar came in the days of Jeremiah, and he destroyed the temple and he burned it with fire, before he burnt with fire, he took all the precious articles out of the temple, and it itemizes most of those things because they returned to the temple in the time of Ezra and Nehemiah, king, was it darius or ahasuerus, gave the holy vessels back to Ezra. The ark is never mentioned. The last time the ark is mentioned, I think it's during the time of hezekiah. It was still in the temple, I think it also says during the time of josiah if I'm not mistaken. Because Jeremiah said very plainly, the city is going to be destroyed, a palace will be burned, the temple will be burned, it's believed that Jeremiah has connected with the priest's family and some of the faithful priests that were left. They took the ark by night and they hid it in a cave and sealed it somewhere in the vicinity of Jerusalem because Jerusalem was besieged by the Babylonians for two years, they couldn't... Some people say, "oh, they carried it off to Egypt or Ethiopia.
" No, they had to hide it in a pretty close proximity to the temple. If you've been to Jerusalem, it is honeycombs with caves. And so literally, they have tombs and caves and tunnels, every time they try and dig and build there, they run into another one. It's in a sealed cave somewhere no one has found it from that day to this. And wouldn't it be something if they did discover it? Wouldn't that be nice? Might be one of the greatest archaeological finds of history. All right, another question. Do you think Jesus will come on the day of atonement? As far as the day of the second coming, will it be on the day of atonement? I don't know. I don't know that he's obligated to do that. Sometimes people say, "will Jesus come at the very time when the jubilee is fulfilled?" You know, God, when we get to heaven, I think we're going to see that God did follow a calendar. When we look back and say, "look at that, it all happened right on schedule.
" I mean, he died on the passover, right, why wouldn't he come on some special event? The only reason I say he may not is because Christ said in such an hour you think not he comes. So he might surprise everybody. And you think he's going to be coming on Sabbath while he might show up on a Wednesday. I mean... So we got to be very careful to say, oh, this is when he should come. There were seven different days, annual days, in the Jewish feasts, and he could come any one of those. Some say, well, wouldn't it be the feast of trumpets? Because he's going to come and there will be a trumpet. And Revelation talks about seven trumpets. And others say, well, it would be like the passover 'cause it's the great deliverance, they had the passover and they came out of Egypt. And others are asking, well, would it be the day of atonement, the final judgment? Almost, every one of the feasts could be connected with the second coming if you want. You see what I'm saying? So we don't know. It probably will be one of them, but I wouldn't start to speculate. What do we know about the day and the hour? Nothing. If you meet someone that says they figured it out, be very careful 'cause Jesus is pretty clear on that. Do we have another question? Oh, here it is, yes. Does the cleansing of sin happen before or after the day of atonement? Well, the putting away of sin is supposed to be happening in God's people now. I mean, God forbid that anybody thinks, well, it's not the day of atonement yet, so I'm not going to repent and turn from my sins. the Lord wants us to... What's the best time to repent of your sins? When the Lord convicts you of your sins, right? What's the best time to apply the blood? When the temple is still open, you don't want to wait until the day of atonement when the laundromat closes. Amen? And so, ultimately, the. .. And maybe I should explain. That gets into the lesson here, so I'm going to finish answering that question in the lesson, looks like I still have time to do that. All right, let's go back. So we talked about the lamb of God. Let me tie this off. We talked about Abraham. And go to Revelation, who is the lamb? Revelation 5:6, "I looked, and behold, in the midst of the throne and of the four living creatures, and in the midst of the elders, stood a lamb as though it had been slain..." Now when John writes that, what does that mean to all of his readers? They need to have some context in the old testament, why are you slaying lambs? What does the slain lamb represent? It represented the lamb of God, forgiveness for sin, a sacrifice happened in the sanctuary. It not only tells us a lamb as though it had been slain having seven horns and seven eyes. Have you ever seen a lamb with seven horns? Now you might see a deer. .. If you're a hunter, you might see that was a 6 pointer, that was an 8 pointer, that was a 12 pointer, they're talking about an even number of antlers, how big the horns were. But you don't ever say that was a seven pointed lamb. The lambs don't grow their horns that way, they have two horns. And then seven eyes, this is obviously symbolic, talking about that God knows all things. Okay. A horn in the Bible represented power. Remember, the visions of Daniel where one horn pushed against the other horn, and these little horns, these kingdoms and powers come up, Christ had this lamb with the seven horns represents perfect power. Now the next section talks about Jesus is our high priest. In Hebrews 7:1, so we got another question we'll get to in just a moment. Hebrews 7:1-3, he talks about this enigmatic individual called melchizedek. Hebrew 7:1-3, "for this melchizedek, king of salem, priest of the most high God, who met Abraham returning from the slaughter of the Kings and blessed him, to whom also Abraham gave a tenth of all, being first translated 'king of righteousness,' and then also king of salem, meaning 'king of peace,' without father, and without genealogy, having neither beginning of days nor end of life, but he's made like The Son of God, he remains a priest continually." Now you need to read Genesis. Let me give you the story. Abraham went to rescue lot. Lot had been carried away captive by chedorlaomer and four other Kings from the north. He attacked sodom and gomorrah, and the two lesser kingdoms in the south, they conquered them. They carried away all the booty from those cities and the people as slaves and they were heading up north. Before they got all the way back to damascus, Abraham in confederacy with some of the other local nomads, mamre and eshkol, they came together with Abraham who had 300 soldiers of his own. They snuck up by night, they attacked chedorlaomer and their forces, they soundly defeated them. They were all drunk celebrating. And he liberated lot and all the captives. It's interesting that God would use Abraham to save sodom and gomorrah. That's why it says in James, don't forget that God saved... Talks about God saved them before he destroyed them. So God had shown them mercy. Anyway, so on his way back, Abraham leading this coalition, he's like the general, he has rights to all of the bounty of this war. He doesn't even give it to the Kings, he liberated them. He said I'm not gonna take even a shoelace from sodom lest you say I made Abraham rich. If I become rich, it'll be God that does it, not because I robbed it from you, but he takes, he says, I will take a tenth and I'm giving it to melchizedek, the King of salem. The word melchizedek means a king, zedek means righteousness, but he's the King of salem, salem, shalom means peace. Later that same spot was known as the jeru-shalom. So here you've got melchizedek, a king of righteousness, he's a priest, it says, of the most high God. Now I thought these were canaanites. What is a priest of the most high God doing in canaan? It's a little mysterious, isn't it? Well, there's been some speculation. Some people say, well, the Bible says, he is without beginning of days or father or mother, that means it was the Holy Spirit. That means it was Jesus. And who was melchizedek? Melchizedek was a real person. The reason it says, Paul says he's without father or mother or genealogy, it just means, there's no genealogy, it doesn't tell what his people are, he just appears and disappears, but he was a real person. The best explanation I've heard, do you realize at the time of this event, shem was still alive, The Son of Noah? He had heard, and he was hundreds of years old, and he served jehovah. He had heard that even though they were serving idols now in mesopotamia that God had led Abraham and he was still serving the true God and given this land to Abraham, he took his family and he moved into the hills of salem. And who else would be greater than Abraham? And he was recognized as a priest of the most high God. He was still live. He's one of the only survivors... The only survivor of the flood at that point, I've heard that explanation, I forget if it's Josephus or some of the Jewish traditions that say that, I thought, don't know that. I can't prove it, you probably can't disprove it, but it's just interesting. And so we don't know who melchizedek was, but he's a real person. He's a type of Christ. It says when Abraham comes, he brings forth bread and wine. And doesn't Jesus make a covenant with us with bread and wine, his blood and his body? And so you look at this, king of righteousness, king of peace, bread and wine, we pay tithe to him. And so Paul then makes a case that melchizedek is a type of Christ, and even though Abraham is going to end up having the levites and The Sons of aaron in his genes, he says Abraham is paying tithe to a greater priest in melchizedek who's a type of a different priesthood, he represents Christ. That was kind of deep, but that's what Paul says, Paul's a little deep. All right, another question. How do you explain the importance of the sanctuary to someone who doesn't believe in its relevance? I'd say we need to prioritize what God prioritizes. And as I mentioned, if God mentions something, almost a thousand times in the Bible, and it goes virtually from Genesis to Revelation, it must be something he wants us to understand. If so many of these apocalyptic visions happened in the context of the sanctuary, now Paul says so much about the plan of salvation connected with the sanctuary and the priesthood in Hebrews, it's a subject he wants us to understand. Does that make sense? So I'm trying to do that really. All right, go to Hebrews 7, talking about Jesus our high priest, verse 24. "But he, because he continues forever," unlike melchizedek, "has an unchangeable priesthood. Therefore he is also able to save to the uttermost of those who come to God through him..." How do we come to God? Through Christ. Christ is our intercessor. You know what a mediator is? Sometimes you get two parties and they just can't come to some solution, you get a third party to come and try and objectively look at both sides and develop peace. Some of you remember the old gas stoves that were really simple? We had one growing up in my day, and it had three settings on it. It had a high, low, and in the middle, it had medium. And medium meant in between the two others. Moses was a mediator. He would go up the mountain, he talked to God for the people. The people said, "don't let God talk to us, we're gonna burn up," you remember? They said, "don't let God talk to us, we can't handle it." They said, "Moses, you talk to God." When Moses came down, they said, "Moses, your face is shining, cover your face." So Moses was like a go-between, he talked to God, his face would shine, he covered his face, he talked to the people. And so he was the mediator. Now who is the mediator now for us with The Father? Jesus. The cross was a ladder that reached from heaven to earth. And do you remember when Jacob had a dream? And what did he dream about? A ladder. And the ladder had angels going up and down, ostensibly, they're bringing prayers and bringing answers to prayers, they're ministering spirits to humanity, they're dispensing the grace and the requests of the saved. It's a heavenly escalator. Philip comes to Jesus. And Jesus said, "oh, Phillip, I saw you under the fig tree.
" He says, "wow, Lord, you're the Messiah." "Are you impressed because I said I saw you under the tree?" Jesus said to Philip, "hereafter, you will see greater things than these, you will see the angels of God ascending and descending on The Son of man." Christ is the mediator, he is the ladder that connects earth with heaven. We pray in whose name? Jesus' Name. It's through Christ that The Father gives us his grace. So he is a mediator, it's telling us. That's the priest's job. Able to save to the uttermost of those who come to God through him since he always lives to make intercession for them. What time of day can you pray to God and ask for your prayers to be answered? Always loves to make intercession. Does the Lord ever say, "uh, you know I've been at this all day, can you just give me a break?" Or is he eager to hear you pray? You can't worry the Lord. He wants to hear you pray more than you want to pray. Let me see here. "For such a high priest was fitting for us, who is holy, harmless, undefiled, separate from sinners, and has become higher than the heavens." I'm gonna read now jump down to Hebrews 9:11-15. "But Christ came as high priest of the good things to come, with greater and more perfect tabernacle made with hands that is not his creation. Not with the blood of goats and calves, but with his own blood," it's a better temple, it's better blood, "he entered the most holy place for all, having obtained eternal redemption. For if the blood of bulls and goats and the ashes of a heifer, sprinkling the unclean, sanctifies for the purifying of the flesh, how much more shall the blood of Christ, who through the eternal spirit offered himself without spot to God cleanse your conscience," so the cleansing happens here too, "from dead works to serve the living God? And for this reason he is the mediator of a new covenant, by means of death, for the redemption of the transgressions under the first covenant, that those who are called might receive the promise of an eternal inheritance." Well, it's a powerful verse. So Jesus is our intercessor. I want to read this to you. I'm looking at the clock, and I wanna make sure and cover something here. Hebrews 9:11, "but Christ came as high priest for the good things to come, with a greater and the more perfect tabernacle not made with hands, not of this creation, not with the blood of goats and calves, but with his own blood he entered the most holy place." When did Jesus entered the most holy place? He first entered the most holy place when he ascended to heaven. Now the day of atonement was something that happened once a year, is typically yom kippur the end of the year. But there was one other time when Moses entered the holy place. You know when that was? After they built the temple, he went in. And the Bible says he offered a sacrifice and he activated the temple, he consecrated all the furniture, he sprinkled blood on it, and then it began their ceremonial cycle. But he first went in and after it was all complete, he sanctified it, he activated it. And he went into the holy of holy places when he did that. Moses could do that as our mediator and high priest. When Jesus ascended to heaven, there is a big argument in the adventist church because we know what happened in 1844, we entered the last phase of his work as our high priest, and he entered into his final ministry in the holy of holies. But when Christ told mary, "do not cling to me, for I have not yet ascended to my father," he had not yet... When he rose from the dead, he had not yet been to heaven. He went to heaven. Now what was the heavenly sanctuary doing before Christ died? Are they offering blood of goats up there? No, the only thing that would be offered in the heavenly sanctuary is Christ pleading his own blood. Am I right? So when Christ rose, he went into the most holy place, he was enthroned. The Father said, "your gift is successful." The angels rejoiced. He spread out his hands and bled his blood, then he comes down to earth. He activated, you might say the heavenly sanctuary, he comes down to earth, and he says, "all hail." Do you notice, he told mary, "do not detain me." But Sunday evening, by the time he comes back down again, he says, "all hail," and they worshiped him. He went to The Father. Jesus says, "I go to my father and your father." And so when people say, "you know, he didn't enter the holy of holies until he ascended until 1844." He did when he first died on the cross and ascended into heaven and activated the heavenly sanctuaries. You've got the biblical example of that in the old testament. Why did the high priest rend his garments when he condemned Jesus? Not only was a veil in the temple rent because we have a new temple, the high priest rent his garments because we have a new priesthood. You and I are a nation of priests in that we make intercession for others with God, we're to do that special work. Ephesians 2:18, "for through him, through Jesus, we both have access by one spirit to The Father.
" Hebrews 9:24, "for Christ has not entered the holy places made with hands, which are copies of the true, but into heaven itself, now to appear in the presence of God for us." So isn't that... You know, don't you like having friends in high places? See, I know people that know the president. And that makes me feel important because I know someone that knows the president. But you and I can say, "we know someone who knows The Father." Through Christ we can have a personal relationship, we can boldly come into his presence. Why wasn't Moses instructed to take the tablets out of the ark to be read to the people? Well, because it was really a sacred object, they had a written transcript of that as well. You'll notice not only in the book of Deuteronomy but in the book of Exodus 20, Deuteronomy 5, the Ten Commandments were written by Moses so we could look at that. How many of you have read the constitution? Some of you have read. How many of you read part of the constitution? Okay, did you pull out the original and read it or did you read a copy? So it serves the same purpose. Well, you know, it looks like we've got just a moment or two left, let me read a couple more verses to you here. Hebrews 8:5, it says, "the earthly things serve as a copy. They are shadows of the heavenly things. As the Moses was divinely instructed when he was about to make the tabernacle. For he said, 'see that you make all things according to the pattern shown you on the mountain.'" And so this was an example of the heavenly. And then I want to close with this verse in Hebrews 9:19. Hebrews 9:19. This is referring to what I just told you about in Exodus. "For Moses, when had spoken every precept to all the people according to the law, he took the blood of calves and goats, and water, and scarlet wool, and hyssop, and he sprinkled both the book itself and all the people, saying." So when he activated the temple, he sprinkled all the furniture, he sprinkled the people saying, "this is the blood of the covenant that God has commanded you. Then likewise he sprinkled with blood both the tabernacle and all the vessels of the ministry." Would that include the ark of the covenant? To sprinkle the ark of the covenant, do you have to go in? "All the vessels of the ministry. And according to the law almost all things are purified with blood, and without shedding of blood there's no remission." So in 1844, you entered the last phase of the church, you got seven phases of the church history. It starts with ephesus and ends with laodicea. The age of laodicea, which means the judging of the people, began in 1844, there's a great revival in the church. And Christ entered the last phase of his ministry which is a time of judgment. God's people right now are a nation of Kings and priests, but we ought to be sanctifying and evaluating our hearts and making sure we are ready. Was God more severe with the priests when they disobeyed? When The Sons of aaron went into the temple drinking, what happened? They were struck down. We are a nation of priests. God is calling for us, standard of holiness among his people, we need a revival. But what does God say about laodicea? Poor, wretched, miserable, blind, naked, think they're rich and increased with goods. We need a revival, friends. God's calling us to be a holy generation, a royal priesthood, and this is the sanctuary message. So there's so much more I could say. Hopefully, you got the gist of it though. One reminder, friends, we have a unique offer, you need to text to get it, and you're going to get a sermon called cleansing the temples, the cleansing of the temples. 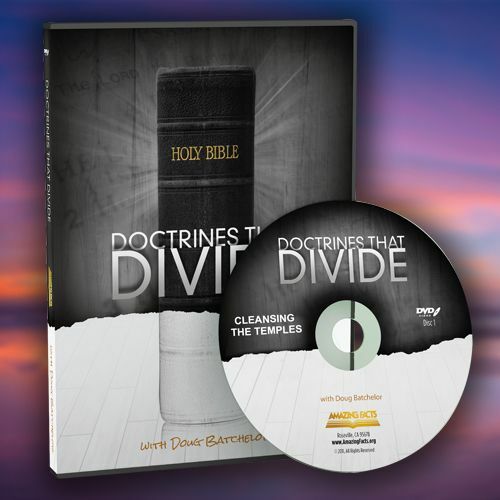 And it's from our series, the doctrines that divide. The text number is 40544, 40544 and text the letters sh014, sh014. And they'll give you the information how you can view that or even I think request a dvd. Thank you very much, friends, I think we're out of time for today's study. God bless you, and we'll study His Word together again next week. Let's face it. It's not always easy to understand everything you read in the Bible. With over 700,000 words contained in 66 books, the Bible can generate a lot of questions. To get biblical straightforward answers, call into Bible answers live, a live nationwide calling radio program where you can talk to Pastor Doug Batchelor and ask him your most difficult Bible questions. For times and stations in your area or to listen to answers online, visit bal.amazingfacts.org.